Barack Obama’s State of the Union address: Like Ted Nugent, Republican lawmakers heard very little that they found appealing in the president’s speech. And Republicans hear very little they like in the president’s State of the Union address. As reporters found their seats in the House press gallery, they shared a question: Where was Ted Nugent? The 64-year old rock star, who last cracked the charts with 1980’s “Wango Tango,” had been invited to the State of the Union as a guest of Texas Rep. Steve Stockman. Thirty-odd Democrats had invited the families of gun violence victims to sit for the speech, but they were never famous. Not even in 1980. BuzzFeed’s D.C. editor, John Stanton, asked a peer to help him find a “tall, crazy-looking” white guy. When President Obama entered the chamber, Nugent stood up, and reporters finally saw him. He spent the entire speech, 13 typed pages, in various stages of physical agony. At the emotional apex of the night, when the president counted off victims who “deserve a vote,” Nugent sat with his arms crossed. A cynic might have looked at Nugent then, attracting swarms of reporters below statues of Bob LaFollette and Huey Long, and asked why the media went so astray. It’s a good question. But Obama’s speech—especially the rousing section on guns—was an appeal for skeptical members of Congress to abandon their positions and come around to his. 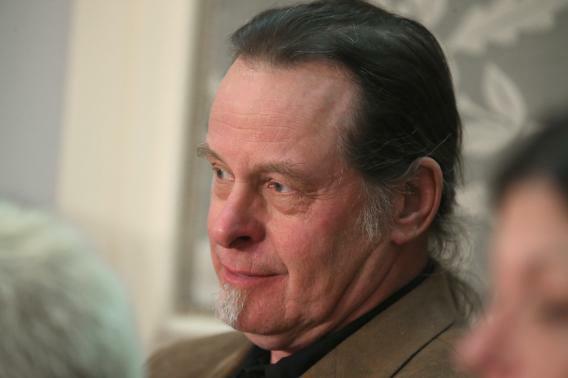 If Nugent joined the Republican caucus, he wouldn’t even be its most conservative member. Someone more conservative could—nay, will—throw up hurdles against a gun bill, or an immigration bill, or a voting reform bill. The problem is that McCain and Graham won’t back Obama on his other priorities, and most Republicans won’t even back him on that one. As the president discussed hiking the minimum wage to $9 an hour and indexing it to inflation, Rep. Greg Walden made exaggerated expressions of disbelief. Walden runs the National Republican Congressional Committee, tasked with keeping the House red. He’s talked openly about how tight gerrymandering has shored up at least 191 of the 218 seats Republicans need to keep control. He wasn’t hearing anything that threatened the party; thus, he wasn’t hearing anything that could get their votes. Nugent was shepherded over to a standing MSNBC camera. Two police officers looked on, confused by the mobile media herd. “Who’s that?” asked one cop.